In Spring 2015, I collaborated with my colleague, Sara Steger, at the University of Georgia, to team-teach two sections of the upper-level English Department course, Writing for the Web. That course is meant to provide a writing-intensive workshop experience in which students compose texts in and for the World Wide Web. With Sara’s background in digital humanities (DH) scholarship, we wanted to introduce students to some of the concepts and techniques used in DH – to give them some experience, in a fairly simple and introductory way, to things like mapping, Dublin Core metadata, and HTML5. We also sketched out space toward the end of the semester for a “research” project, though we weren’t exactly sure what we wanted that to entail. That is, until the DRC Wiki presented itself as an opportunity. DRC Fellow and UGA graduate student (now the Assistant Director of UGA’s Franklin College Writing Intensive Program), Lindsey Harding, asked if we might be interested in having students work with the wiki and it seemed the perfect platform for combining research with providing experience in working with a common genre of Web writing. We decided to have students write entries (either as a single author or with a partner) on particular concepts or tools that we had discussed or studied during the semester. We asked students to draw on the conventions and practices articulated by Wikipedia’s Manual of Style (MOS) and Writing Better Articles, an “explanatory supplement” to the MOS. We viewed Wikipedia as the paragon of the wiki genre and, since it has a robust set of resources for writers/editors ready-to-hand, it made sense to introduce students to wiki conventions and practices through the wiki resource they were most familiar with. We spent time studying some exemplar Wikipedia articles and generated a set of criteria, heavily informed by Wikipedia’s guidelines and best practices, for both content and design that we would use for our own DRC Wiki entries. You can take a look at those criteria here: Class Generated Wiki Evaluation Criteria. We then set up sandbox pages for each student in which they could work on their articles and learn the ins and outs of Wikimedia’s markup language, a language we hoped would be less daunting since they had already had projects that introduced them to other forms of textual markup, including HTML5 and Dublin Core. We also provided students with a list of journals focusing on rhetoric and composition and digital media/technology to help them get started with the research process. Ultimately, while the markup aspect of the project was certainly challenging, it was really the research aspect of the project that presented the bigger challenges. Upon reflection, we realized that this was the result of a failure to effectively scaffold the research process and the larger subject matter of digital rhetoric. One of the biggest challenges of this project was the balancing act required in writing an objective reference article for a specialized wiki. 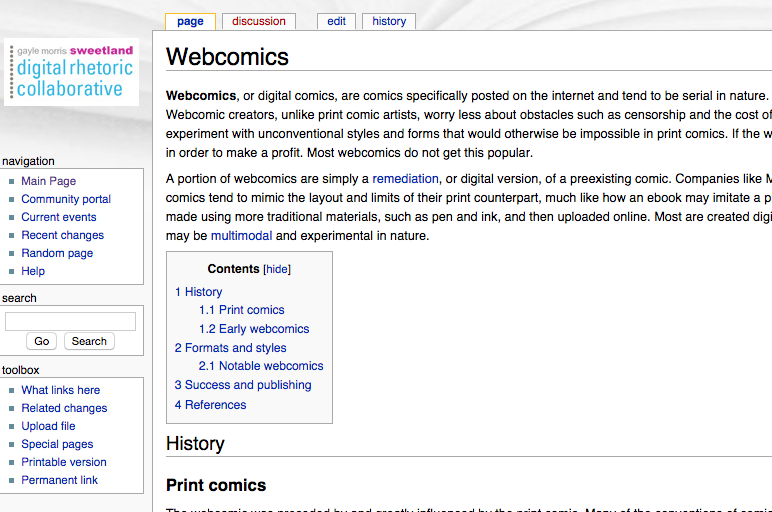 How should an article about, say, Creative Commons or the semantic web, be written differently for the DRC Wiki than from a Wikipedia article on the same subject? 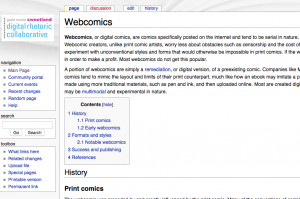 While a few students managed to steer that complicated course to be both informative and engaged with the discourse community of techrhet (e.g., this entry on “Webcomics”), the majority could not effectively place the concept or technology within the concerns of the field of digital rhetoric. The project exposed the need for a much more sustained engagement with digital rhetoric as a field and with scaffolding core concepts in digital rhetoric to build comprehension and enable students to feel confident and competent as wiki authors. The entries did more to tell me what students understood and did not understand than any other project or activity we did in the course, which was certainly important. Unfortunately, the picture that emerged of student learning about such key course concepts as affordances, remediation, or fair use was not what I might have hoped for by close to the end of the term. In retrospect, it was clear that the wiki project needed much more close attention and a focus on research methods and techniques in order to help students understand their subject matter and draw on reliable sources effectively. Having students work independently on their articles also prevented the kind of crowdsourcing of knowledge that is fundamental to wiki writing and that would perhaps have enabled stronger articles to emerge. Still, a course like this one that is meant to provide a broad picture of writing for the web creates difficulties for instructors who hope to provide a range of experiences in different genres, as well as introduce students to core concepts in digital rhetoric that will give them a foundation for understanding the medium and the rhetorical principles and strategies that they need to approach writing tasks, tools, and forms that may not even be invented yet. Even in the second semester of using the wiki, when I asked students to collaborate in teams to revise an article (instead of write a new one from scratch), there remained problems in finding and using the kinds of source material that would help them construct a well-sourced article and in comprehension of the significance of particular digital rhetorical concepts for the field. Consider the course and its objectives. Is your course a broadly conceived digital media writing course? Will it provide enough opportunities for you to delve into digital rhetorical concepts, techniques, and tools in a sustained enough manner to build strong content and disciplinary knowledge? Will students feel secure in having the background they need to contextualize and frame their information for users who will come to this wiki – as opposed to a general reference source like Wikipedia – for its focus on digital rhetoric? Courses that have a strong rhetorical/media theory component or that are oriented toward digital literacy/pedagogy may be better fits for DRC Wiki work. Scaffold the wiki writing/editing work AND the research process. Provide students with plenty of opportunities to consider the conventions and best practices of wiki writing. I believe that one of the most important aspects of this project was the knowledge students gained about the wiki genre, its conventions and practices. Though they use wikis regularly, many students had no real conception of the editing process, the collaborative way that articles are developed, and the necessity of supporting facts and information with reliable (preferably peer reviewed) source material. This requires opportunities to collectively analyze and discuss good examples of wiki entries in order to help students become comfortable with the form. It also requires a good deal of time and scaffolding of the research process, including helping students find excellent source material, process that material, and put it into application. In my experience, I realize that I should have devoted much more time to staging the research process with annotated bibliographies, literature reviews, and other activities that would have helped students summarize and synthesize research, and then make smart choices about what material to use in their articles. Find opportunities for collaboration and crowdsourcing. In retrospect, the biggest missed opportunity in my use of the DRC Wiki was not making it an “authentic” wiki writing experience. By authentic, I mean the collaborative aspect of wiki writing and editing that is probably the most important characteristic of the genre. Wikis are best when they draw on the wisdom of crowds to build knowledge collectively and to ensure that the information is accurate, well-written and supported, and updated as new information becomes available. The DRC is a ready-to-hand resource, a knowledge community that could be productively drawn into the wiki writing and editing process to provide feedback through suggested edits on article talk pages and to even collaborate with students more directly. While the wiki entries my students have created and revised may reveal an incomplete understanding of a concept or a technology, they are still valuable as starting points for their own practice in a genre and in their development as digital writers. The DRC Wiki has also provided me with an opportunity to think critically about my own pedagogy and how to ensure that students get the most out of the experience of working with this resource. This process of learning together is something that I want to build on. Elizabeth Davis is the Coordinator of the Writing Certificate Program at the University of Georgia. She teaches and conducts research on writing for digital media and electronic portfolios.